Insightful & personalized coaching sessions designed specifically to guide you and your company. Are You Ready To Maximize Your Full Potential? 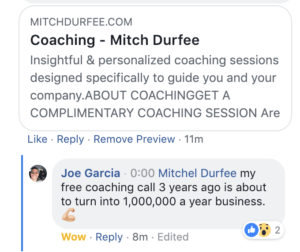 Each one-on-one coaching session is delivered by Mitch Durfee and is UNIQUELY designed for you to identify the opportunities for growth within your life and business. Mitch will then personally work with you to create an actionable plan that will maximize your areas for growth. By using Mitch Durfee’s unique tools, tactics and strategies for business, finance and marketing you will be able to streamline your processes and maximize your full potential in business and in life. Entrepreneur. Speaker. Business Coach. Durfee’s work with small business owners can quickly identify core issues holding you back and help you develop a new strategy to move you forward. Developed a business from 0 to $6mm in sales. Durfee specialization is working with product marketing and service type industries that want to grow their brand by increasing their demand in the market and increasing profits to continue that growth. Build Your Million Dollar Team, and Processes, so that you have more free time and massive results. This is the foundation. Have you ever heard the saying that “your network is your networth”? It’s true. Your income is directly correlated with the size and quality of your network! If you want to move your business ‘from zero to hero’ you must have clear goals. Goals give you a target to shoot for and the inspiration to push through obstacles and achieve greatness. To be successful, you need to have a positive mental attitude, or PMA. Stop looking at failure as bad thing. Failure is an opportunity to learn. Winners don’t always win, but they never quit. Dreaming and visualizing is terrific. But without action, you’ll never achieve anything. Find a balance between thinking and doing. And when you know what you want, go out and just do it! When I started my business I had people come up to me and ask me why I was trying so hard and why did I have to be so good. I was thinking I was the freak until I met Mitch Durfee. He was an even bigger freak than I was and there is a lot us out there looking to achieve more success. When I met Mitch and I knew he could drive more than I could and it was ok to be good, it was ok to try hard, it was ok to achieve more. Mitch has been helping me out a lot lately and it’s really nice to hear him talk about some of his goals and some of the challenges and the things he’s willing to do to get to the next level. He is one of those rare gems that is not willing to go alone. He wants to go to the next level in life but he wants to take as many as possible with him and that a rare find in people. One of the ways he’s personally helping me is he is helping me get my book published and I have been trying for a year. I really appreciate all that you do for other people and I love watching your story. I sell luxury real estate and I want to tell you about Mitch Durfee’s course on building a million dollar team. When you build a team you really transition from having a job to having an actual business and that business can help free up your time, allow you to do more things with your family, to reach for the stars and build other business. But you can’t do that until you actually build a successful business yourself. One that helps you get to the next place in life. If you want the best shot of doing it check out Mitch Durfee’s course. Do the right thing, do the best you can, and always show people you care! Take the time to develop your goals, write them down, visit them often, and make a game plan to achieve each one. It’s no secret the more you learn, the more you earn! Seek out new resources and ways of learning- be a sponge! Ideas are nothing without execution. Hire a coach and get a hard-working accountability partner to keep you moving forward.